References m_EndnoteSpinHanderID, m_EndPlaceID, m_EndRestartSectionID, m_EndStyleID, m_FootnoteSpinHanderID, m_FootNumberingID, m_FootStyleID, m_oEndnoteSpinAdj, m_oFootnoteSpinAdj, m_wButtonApply, m_wEndnoteSpin, m_wEndnotesPlaceMenu, m_wEndnotesRestartOnSection, m_wEndnotesStyleMenu, m_wFootnoteNumberingMenu, m_wFootnoteSpin, m_wFootnotesStyleMenu, and m_windowMain. References m_EndnoteSpinHanderID, m_EndPlaceID, m_EndRestartSectionID, m_EndStyleID, m_FootnoteSpinHanderID, m_FootNumberingID, m_FootStyleID, m_wEndnoteSpin, m_wEndnotesPlaceMenu, m_wEndnotesRestartOnSection, m_wEndnotesStyleMenu, m_wFootnoteNumberingMenu, m_wFootnoteSpin, m_wFootnotesStyleMenu, s_EndInitial(), s_EndRestartSection(), s_FootInitial(), s_menu_item_endnote_activate(), s_menu_item_endnote_style(), s_menu_item_footnote_activate(), and s_menu_item_footnote_style(). References _connectSignals(), _populateCombo(), abiDialogSetTitle(), XAP_Dialog::getApp(), AP_Dialog_FormatFootnotes::getFootnoteTypeLabelList(), XAP_App::getStringSet(), XAP_StringSet::getValueUTF8(), localizeButton(), localizeLabel(), localizeLabelMarkup(), m_oEndnoteSpinAdj, m_oFootnoteSpinAdj, m_wEndnoteSpin, m_wEndnotesPlaceMenu, m_wEndnotesRestartOnSection, m_wEndnotesStyleMenu, m_wFootnoteNumberingMenu, m_wFootnoteSpin, m_wFootnotesStyleMenu, newDialogBuilder(), refreshVals(), s, UT_ASSERT, XAP_appendComboBoxText(), and XAP_makeGtkComboBoxText(). References AP_Dialog_FormatFootnotes::getEndnoteVal(), m_wEndnoteSpin, refreshVals(), and AP_Dialog_FormatFootnotes::setEndnoteVal(). 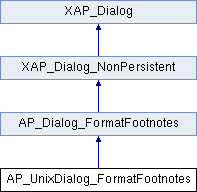 References AP_Dialog_FormatFootnotes::getFootnoteVal(), m_wFootnoteSpin, refreshVals(), AP_Dialog_FormatFootnotes::setFootnoteVal(), and UT_DEBUGMSG. References refreshVals(), AP_Dialog_FormatFootnotes::setPlaceAtDocEnd(), AP_Dialog_FormatFootnotes::setPlaceAtSecEnd(), and UT_ASSERT. References refreshVals(), AP_Dialog_FormatFootnotes::setRestartFootnoteOnPage(), AP_Dialog_FormatFootnotes::setRestartFootnoteOnSection(), and UT_ASSERT. References AP_Dialog_FormatFootnotes::getEndnoteType(), AP_Dialog_FormatFootnotes::getEndnoteVal(), AP_Dialog_FormatFootnotes::getFootnoteType(), AP_Dialog_FormatFootnotes::getFootnoteVal(), AP_Dialog_FormatFootnotes::getPlaceAtDocEnd(), AP_Dialog_FormatFootnotes::getPlaceAtSecEnd(), AP_Dialog_FormatFootnotes::getRestartEndnoteOnSection(), AP_Dialog_FormatFootnotes::getRestartFootnoteOnPage(), AP_Dialog_FormatFootnotes::getRestartFootnoteOnSection(), m_EndPlaceID, m_EndRestartSectionID, m_FootNumberingID, m_wEndnoteSpin, m_wEndnotesPlaceMenu, m_wEndnotesRestartOnSection, m_wEndnotesStyleMenu, m_wFootnoteNumberingMenu, m_wFootnoteSpin, m_wFootnotesStyleMenu, and XAP_comboBoxSetActiveFromIntCol(). Referenced by _constructWindow(), event_EndInitialValueChange(), event_FootInitialValueChange(), event_MenuEndnoteChange(), event_MenuFootnoteChange(), event_MenuStyleEndnoteChange(), event_MenuStyleFootnoteChange(), and runModal(). References _constructWindow(), abiRunModalDialog(), BUTTON_DELETE, event_Apply(), event_Cancel(), event_Delete(), m_windowMain, refreshVals(), AP_Dialog_FormatFootnotes::setFrame(), AP_Dialog_FormatFootnotes::setInitialValues(), UT_DEBUGMSG, and UT_return_if_fail. Referenced by _connectSignals(), and AP_UnixDialog_FormatFootnotes(). Referenced by _connectSignals(), AP_UnixDialog_FormatFootnotes(), and refreshVals(). Referenced by _constructWindow(), and AP_UnixDialog_FormatFootnotes(). Referenced by _connectSignals(), _constructWindow(), AP_UnixDialog_FormatFootnotes(), event_EndInitialValueChange(), and refreshVals(). Referenced by _connectSignals(), _constructWindow(), AP_UnixDialog_FormatFootnotes(), and refreshVals(). Referenced by _connectSignals(), _constructWindow(), AP_UnixDialog_FormatFootnotes(), event_EndRestartSection(), and refreshVals(). Referenced by _connectSignals(), _constructWindow(), AP_UnixDialog_FormatFootnotes(), event_FootInitialValueChange(), and refreshVals(). Referenced by AP_UnixDialog_FormatFootnotes(), and runModal().